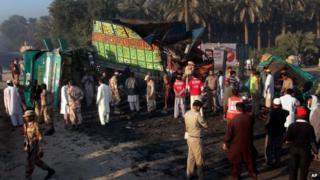 At least 50 people have been killed in an accident involving a bus and a truck in southern Pakistan. The bus collided head-on with a goods vehicle near the city of Khairpur in Sindh province, officials say. The bus was travelling overnight from Swat, in the north-west, to the port city of Karachi. Deadly accidents are common on Pakistan's roads - often caused by reckless driving, poorly maintained surfaces or unsuitable vehicles. The BBC's Shahzeb Jillani in Islamabad says that most of those killed in the accident early on Tuesday morning were women and children. At least 15 people were injured - some seriously - and are being treated in hospital. Medical Superintendent of the Khairpur district hospital Ghulam Jaffar Soomro told Geo TV that it looked as if the bus overturned at high speed. Police say there were 65 passengers in the bus and that a morning fog which covered the highway at the time of the collision could have played a part in the accident.